Samsung seems to have arrived with a desire to bring revolution in the 5-inch tablet segment with their new release Galaxy Note. 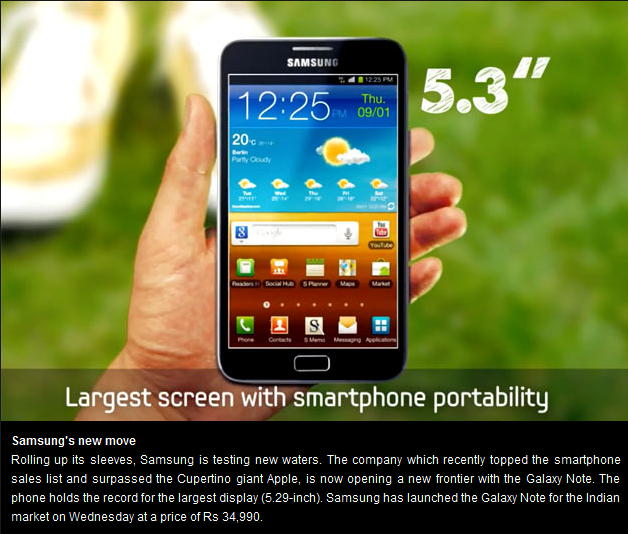 Samsung has described as a large smart phone instead of small tablet. The Galaxy Note is big is size, it can be termed as the stretched and bigger form of the Galaxy S II. From its features it is aptly credited as a phone instead of a smart phone. Despite its large size, the phone is comfortably thin and light in weight. The entire phone is made is of plastic except for its display. The Galaxy Note has the power button on the right and a volume rocker on the left. All the buttons are on the phone are exactly at the top. At the back side of the phone there is an 8 mp camera with LED flash and a loudspeaker near the bottom. The battery cover on the Galaxy Note is seems to thinnest ever observed on any device. Below the cover is the massive 2,500mAh battery. The display on the Galaxy Note is its biggest feature and USP. It is a huge 5.3-inch, Super AMOLED display. The Galaxy Note is the first smartphone to have an HD display. That’s 1280 x 800 pixels in the palm of your hands. It is made of PenTile matrix layout for the subpixel. The big size of the display makes it advantageous with respect to the features like as video playback and web browsing. Galaxy note has a dual core 1.4GHz Cortex A9 with the same Mali-400 GPU and 1GB of RAM. For the storage it has 2GB phone memory, 16GB USB storage (of which 11GB is available to the user) and microSD expansion up to 32GB. There are other additions like an FM radio, voice recorder, and stop watch and countdown timer. Video playback is one of the things this phone ought to be purchased. Finally, it has a battery charge up of 24 hours.